How do membrane reservoirs alter membrane tension? Membrane area is very closely linked to membrane tension, cytoskeletal attachment and membrane reservoirs. During cell spreading, the initial increase in membrane area requirements are met by depleting membrane reservoirs with the morphology of large folds such as microvilli, spikes, filopodia and ruffles. Once these reservoirs are depleted, membrane tension increases and activates exocytosis as well as myosin contraction . The actin cytoskeleton under these reservoirs disassembles while the polymerizing actin in the protruding part (lamellipodia) of the spreading cell pushes the membrane forward. Besides these large membrane reservoirs, smaller membrane reservoirs have been described and characterized . Raucher and Sheetz characterized these membrane reservoirs by measuring membrane area that is drawn into a membrane tether of constant diameter using laser tweezers. They demonstrated that the size of membrane reservoirs is limited by membrane tension as well as cytoskeletal rigidity. As cytoskeletal rigidity or membrane tension increased, the size of the reservoir reduced and vice versa. This balance enables the cell to maintain a membrane reservoir that buffers against fluctuations in membrane tension, and these reservoirs could either be invaginations or evaginations such as filopodia. 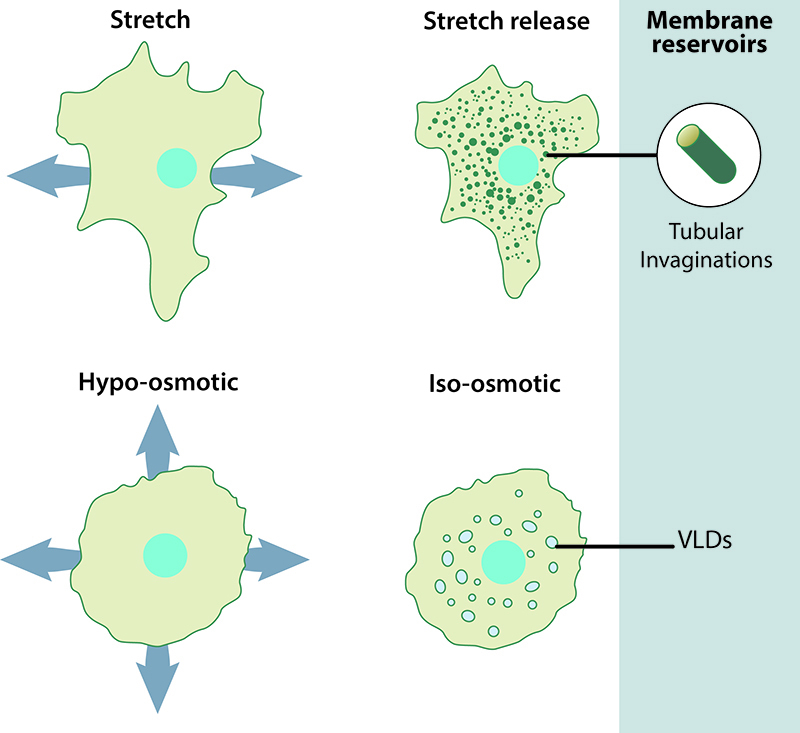 Kosmalska et al described the formation of small membrane reservoirs upon release of membrane stress in physically stretched cells or restoration of isotonic conditions in osmotically stressed cells  (Figure). These membrane reservoirs formed almost instantaneously through a passive, purely mechanical process and were not influenced by the cytoskeleton. Their resorption, however, required active membrane remodeling. As reservoirs can store and release membrane upon subsequent stretch cycles, they may function to support the constant requirement of membrane remodeling in vital processes where cells undergo continual cycles of stretch and relaxation. The nature of these membrane reservoirs differed depending on the type of mechanical stimuli. For instance, tubular invaginations resulted from stretch release whereas osmotic shock caused larger vacuole-like dilations (VLDs). Contrary to the previous notion that VLDs regulated membrane area, this study found that VLDs were pockets where water collected following recovery from osmotic shock, and collapsed VLDs with all the water leaked out looked no different from membrane reservoirs. This suggested a unified mechanism of membrane remodeling irrespective of the nature of mechanical stimuli. What lipids are found in the plasma membrane? What types of proteins are found in the plasma membrane?